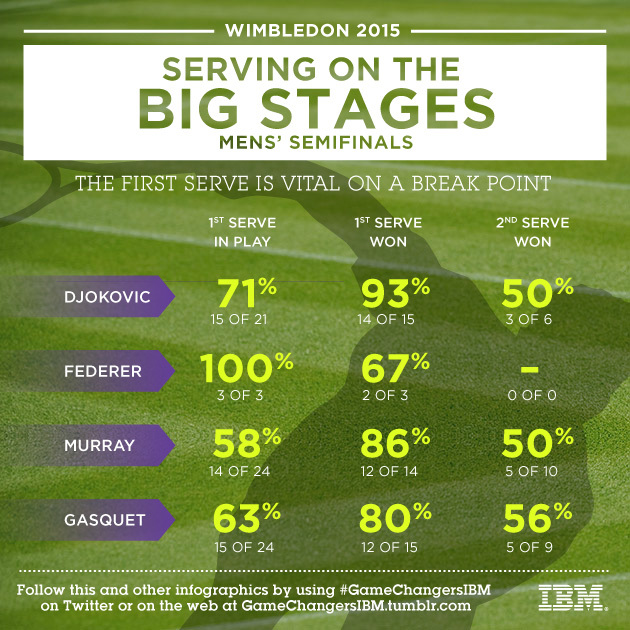 A look at the importance of a first serve on break point for the Wimbledon 2015 men's semifinalists—Novak Djokovic, Richard Gasquet, Roger Federer and Andy Murray. How important is a first serve on break point? For the Wimbledon 2015 men's semifinalists—Novak Djokovic, Richard Gasquet, Roger Federer and Andy Murray—missing a first serve on break point makes it a 50-50 proposition. Hitting a first serve in on break point doesn’t guarantee success, but it certainly puts the odds in the server’s favor.